Portrait of an Unknown Woman is an 1883 Portrait painting for sale by a great Russian painter Ivan Kramskoi, who was an excellent leader of the Russian democratic art movement. This is a portrait of considerable high aesthetic value. 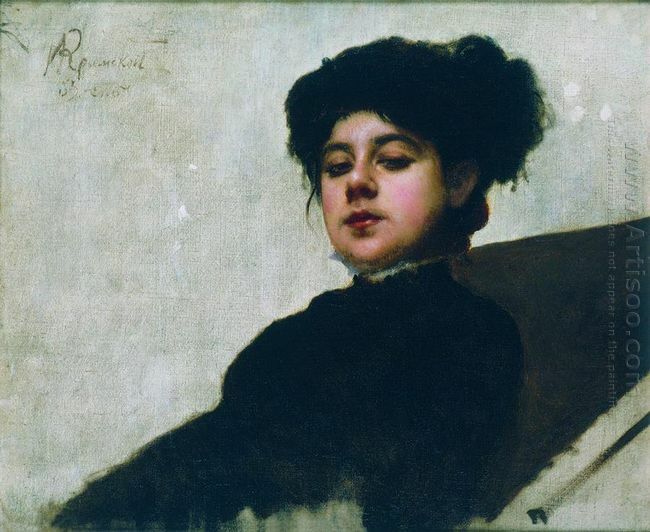 The painter created a perfect image of the woman in 19th-century Russia with Realistic thoughts and showed the character spirit and temperament with consummate skills. The unknown woman in the painting is arrogant and proud, dressed in luxurious costumes of Russian high society. The background is the famous Alexander Theatre in St. Petersburg. However, the identity of the model is still unknown. Because this oil painting was created in the same time as "Anna Karenina" by Leo Tolstoy, some people believed that she was just the Anna Karenina. It was also said that she was an actress. No matter who she was, her quiet strength and forthright gaze impressed most people. The painter created p a new expression style in portraits that is use thematic plot to depict the portrait demonstrating a resolute, decisive and youthful Russian women intellectuals. It was quite successful and became one of Russia best-known art works. Portrait of an Unknown Woman combines elements of the genre and portrait traditions in art. We can feel her personality through her sensuous lips, lazy eyes and thick eyebrows. She was sitting sideways, turned her head overlooking the cold and heartless world, seemed arrogant and proud. This posture revealed her incompatible with the world .this implied a part of the democratic attitude of the intellectuals to the society. Though this work now gain a great popularity, when it first exhibited many critics I were angry they thought the woman in the painting was a haughty and immoral woman which was not accepted by the contemporary social taste. The title of the reproduction painting is unknown and there was no evidence showing any information of her identity, so this aroused much guess and became enigmatic.